We are ready to share traffic with your website under the following conditions. 1. If you want us to give you an approx 2k direct traffic daily with an increase of 0.90% weekly. You have to do some adjustments with your website. IT MAY BE Technical,design wise or its policy. One of our team member will help you in resolving this. 2. 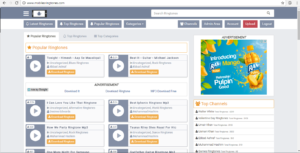 You can simply create a new post at your website about ringtones, use our EMBED codes for ringtones to be displayed in your post.And we will send traffic to those posts. 3. Become our official premium partner, Run a complete website of ringtones. We will share massive traffic with your website but you have to use your own CHANNEL ringtones and will be using their embed codes to display them on your site. To bring new content to your website. Simply upload it in your channel and use embed feature. If your are confused AND need some more help in understanding this, just drop us an email or use our contact form, You can even comment below this post and we will get back to you.